The ASR XL Acetabular Hip System and ASR Hip Resurfacing System were voluntarily recalled by DePuy Orthopaedics in August 2010 due to higher-than-expected 5-year failure rates reported by the National Joint Registry of England and Wales – 13% for the total hip arthroplasty implant and 12% for the resurfacing device. Since then, joint replacement surgeons have carefully monitored their patients who received these implants – or any metal-on-metal implant – to ensure they are not experiencing any adverse effects or, if they are, to determine when revision procedures are warranted. They have also reviewed their patient records to assess the failure rates in their practices and look for predictors of which patients are more likely to experience a failed implant. 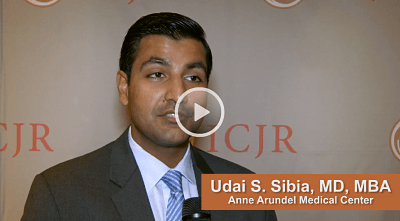 One such data set was presented at ICJR’s recent Transatlantic Orthropaedic Congress by Udai S. Sibia, MD, orthopaedic research fellow at Anne Arundel Medical Center, Annapolis, Maryland. Dr. Sibia reported on a retrospective review of data from a single surgeon affiliated with the medical center who had used the ASR hip implant from December 2005 to November 2009 in 32 hip replacements in 29 patients. The 5-year revision rate was found to be 41.4% (11 patients with 12 hip replacements), with mean time to revision of 3.4 years. Dr. Sibia and his colleagues did not find any variables – including age, gender, BMI, acetabular component abduction angle, or acetabulum size – that were predictive of failure. Serum cobalt (7.6 vs. 6.8 μg/L; P=0.58) and chromium (5.0 vs. 2.2 μg/L; P=0.31) levels were not significantly higher in the revised group than in the unrevised group. Significant decreases in serum cobalt (90%) and serum chromium (79%) levels were observed less than a year after the revision procedures. We spoke with Dr. Sibia about these results at the Transatlantic Orthopaedic Congress. Click the image above to hear his comments. Sibia US, Fowler MB, Stone AH, King PJ. Minimum five-year follow-up of articular surface replacement (ASR) acetabular components used in total hip arthroplasty. Presented at the Transatlantic Orthopaedic Congress, October 1-4, 2015, New York, New York.